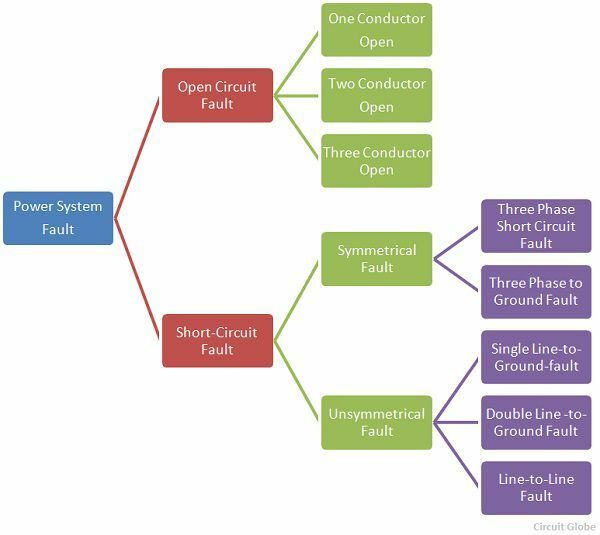 The different types of power system fault are shown below in the image. The faults in the power system may occur because of the number of natural disturbances like lightning, high-speed winds, earthquake, etc. It may also occur because of some accidents like falling off a tree, vehicle colliding, with supporting structure, aeroplane crashing, etc. The open circuit fault is shown in the figure below. In this type of fault, the conductors of the different phases come into contact with each other with a power line, power transformer or any other circuit element due to which the large current flow in one or two phases of the system. The short-circuit fault is divided into the symmetrical and unsymmetrical fault. a. Line – Line – Line Fault – Such types of faults are balanced, i.e., the system remains symmetrical even after the fault. The L – L – L fault occurs rarely, but it is the most severe type of fault which involves the largest current. This large current is used for determining the rating of the circuit breaker. 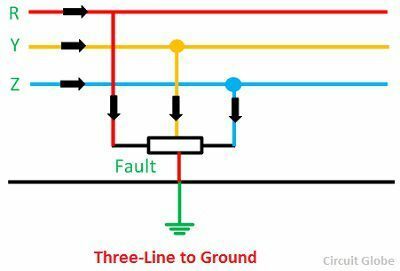 b. L – L – L – G (Three-phase line to the ground fault) – The three-phase line to ground fault includes all the three phase of the system. The L – L – L – G fault occurs between the three phases and the ground of the system. The probability of occurrence of such type of fault is nearly 2 to 3 percent. The unsymmetrical fault is the most common types of fault occur in the power system. 1. 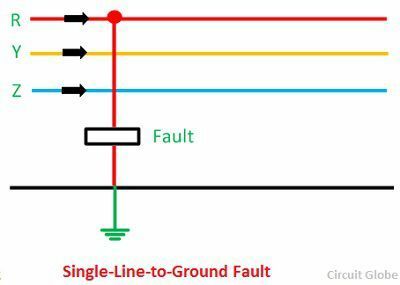 Single Line-to-Line Ground – The single line of ground fault occurs when one conductor falls to the ground or contact the neutral conductor. The 70 – 80 percent of the fault in the power system is the single line-to-ground fault. 2. 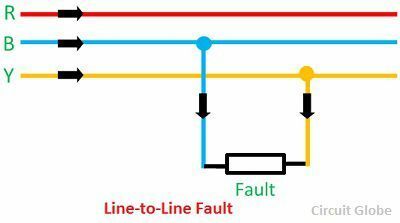 Line – to – Line Fault – A line-to-line fault occurs when two conductors are short circuited. The major cause of this type of fault is the heavy wind. The heavy wind swinging the line conductors which may touch together and hence cause short-circuit. The percentage of such type of faults is approximately 15 – 20%. 3. 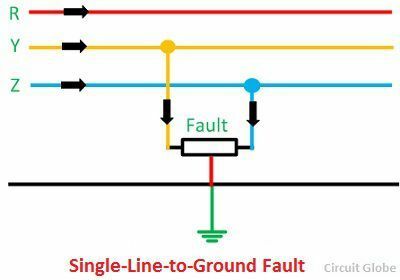 Double Line – to – line Ground Fault – In double line-to-ground fault, the two lines come in contact with each other along with the ground. The probability of such types of faults is nearly 10 %. The symmetrical and unsymmetrical fault mainly occurs in the terminal of the generator, and the open circuit and short circuit fault occur on the transmission line.